One would imagine, after the floodlights bizarrely went dead with just a minute of first half stoppage time remaining, that the brilliance of Stephan Schröck and Phil Younghusband would have been sufficient to illuminate the Rizal Memorial. The ensuing interruption threatened but ultimately could not overshadow a glowing performance not only by the two Filipinos but also the rest of their teammates. Schröck was at his effervescent best, the fact that he was deployed in the unfamiliar role at the left flank notwithstanding. He taunted the Cambodians with his quickness of feet and thought; and if there was a game played called Guess the Bündesliga player, even the short on wits would have guessed without much effort. Younghusband, on the other hand, shone in a manner with which he had not done for sometime; and having an intelligent and mobile striking partner in the debuting Javier Patiňo was enough to rejuvenate the Philippines’ top goalscorer. This match always had the potential, for the Philippines, of becoming a proverbial banana skin. With Brunei’s mysterious ‘unavoidable circumstances’ reducing the qualifying group into a three-team tournament, and with Turkmenistan already having thrown down the gauntlet with a resounding 7-nil win over Cambodia on opening day, the onus always was on the home team to produce a performance equally replete with goals. Finally, the skies relented and the match was able to resume. When it did, the Philippines seemed to have lost its rhythm; and coupled with Cambodia’s shameless gamesmanship, the result seemed to be going very much in Turkmenistan’s favour. But with two teams of similar calibre and one rank outsiders, it was always that Cambodia would ironically be the team who would have not just a little say in who eventually goes on to the Maldives. The Cambodians were, perhaps, not just a tad naïve in approaching the match against the Turkmen openly. Whatever the coaching staff say about being in Manila for the experience, seven goals is never a pretty sight on the scoreboard if these are scored against you. 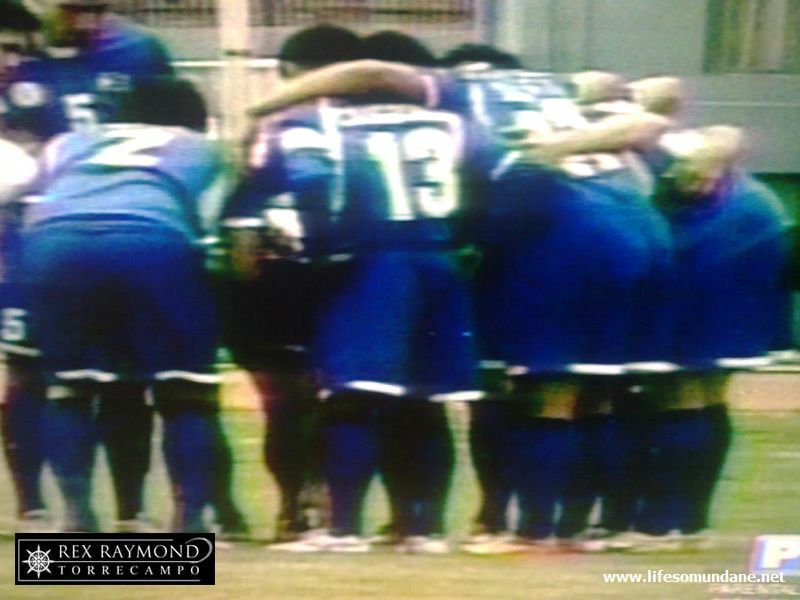 Thus, it was no surprise that Cambodia came to the Rizal Memorial totally bereft of ambition, defending with as many as ten men on occasions. Their first meaningful break did not come until the 40th minute; and first shot from a freekick one minute later. Roland Müller’s catch was routine; but by then the Philippines were 4-nil up, anyway. Aware of the Cambodians’ lack of stature, the Philippines approached the game patiently, linking together intricate passes in midfiend and then launching crosses from either flank. Yet, it took good old-fashioned route one football to finally unlock the Cambodian defence. Carli de Murga launched a long searching diagonal ball from the back in the 25th minute, Younghusband controlled it beautifully with his thigh and poked the ball home while still off-balanced. If Younghusband’s first goal was scrappy, the second was sublime. Neat interplay down the left flank freed the striker in the 31st minute; and he curled a lovely ball around the Cambodian goalkeeper for his brace. Just two more minutes later and Younghusband’s hattrick was complete. De Murga again provided the cross which the striker headed against the bar and down past the line for a goal. Patiňo had been having a quietly effective match, despite the hype quickly apparent as a team player. His contribution in the first half had been mostly to take defenders away from Younghusband, even dropping deep at times to help link up play. Before the half was over, Younghusband rewarded him with a chance to score on his debut. Schröck started the move by drawing two defenders to himself before slipping the ball to Younghusband. The latter swivelled and played the ball square first time for Patiňo to tap in for his first goal for his country. The Philippines, thus, went in for the break having scored the same number of first half goals as Turkmenistan did against the same team in the opening game. The second half, therefore, was all about opening the floodgates. The intriguing prospect was that if the Philippines could score at least the same number of goals in the first half, then it would go into the crunch match against Turkmenistan needing only a draw to qualify for the tournament proper in the Maldives. A quick goal by Schröck in the first minute of the second half along with Patiňo’s brace in the 56th minute meant that the Philippines were just one goal short of Turkmenistan’s goal output against Cambodia. The night being what it was, however, the floodgates really did open. Rain of the sort one usually equates with June or July fell from the skies; enough, at any rate, for the referee to suspend the match for a whole hour. When Patiňo headed against the bar in the 80th minute followed soon after by a header by Angel Guirado that just missed the far post, one sort of wondered if this match was going to be a case, for the Philippines, of getting so close and yet still being so far. As it happened, who else but Younghusband would ensure that all of Cambodia’s theatrics would come to naught. Schröck played in a delightful ball from the left, Cambodia’s theatrical goalkeeper missed it and Younghusband was at the far post to tap in the goal that ensured that the Philippines would at least be level with Turkmenistan going into Tuesday’s final match. Of course, a day as wicked as this could not have ended without a twist; and, in fact, there were two. First, Paul Mulders was given his marching orders for kicking the ball against a Cambodian player. How significant this bit of petulance will be, we will all find out on Tuesday against Turkmenistan. The final twist, however, came in the final minute of normal time. The Philippines won a corner on the right flank which Schröck took. The ball was headed down but initially saved by the Cambodian goalkeeper. Who else but de Murga was there to stab the ball in for the Philippines’ 8th goal of the match, one which ensured that the pressure swings to Turkmenistan in the group’s final match on Tuesday. Not that, on the basis of tonight’s performance, beating the Central Asians will be a colossal task for the Filipinos. Tonight was not at all only about the eight goals that the Philippines scored. More importantly, it was about a fluid, masterful performance that insinuated that the team will be not only good value for topping the group but for winning the Challenge Cup as well. We will all find out on Tuesday, won’t we?